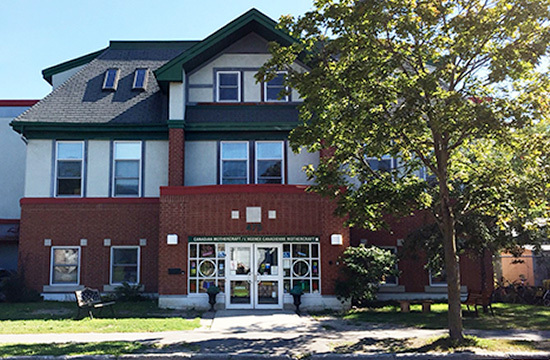 Located at Mothercraft Ottawa’s Evered Avenue location, the EarlyON Child and Family Centre is one of six EarlyON Child and Family Centres across Ottawa. Programs and our services are free of charge for all parents and caregivers of children aged 0 to 6 years, residing in Ontario. Regulated by the Ministry of Education, our programs and services provide opportunities for all children six years of age and under, together with their parents/caregivers, to participate in play and inquiry-based programs, and for parents and caregivers to receive support in their roles and have access to information about child development and specialized services as needed. A variety of early learning activities and socializing opportunities for parents and/or caregivers of children under the age of six. Available on site, by phone or by email to answer your questions or refer you to appropriate community resources. A large variety of toys and books for children under the age of six as well as resources for parents and/or caregivers. Topics include early childhood development, parenting, prenatal, fitness, etc. Best Start is a comprehensive, evidence-based early learning and care strategy designed to give Ontario’s children the best possible start in life and help them achieve success in school. The aim is to create a system of services that seamlessly support families and children from birth through their transition into grade one. It focuses primarily on meeting the children’s and families’ needs by strengthening, enhancing, building on and integrating programs and services right within their own communities. Yes. All programs and services offered through EarlyON Child and Family Centres are free of charge for parents and caregivers of young children under the age of 6 years living in Ontario. If you are a parent or caregiver of a child, up to the age of six, you are welcome at the EarlyON Child and Family Centre in your community. Are there services at EarlyON Child and Family Centres for children above the age of six? EarlyON Child and Family Centres are mandated to offer programs and services for children up to the age of six. Staff at the Centres may also help families find information about other community services. While the focus is on the early years, staff may have information about other services, programs and resources for children older than six. Who works at EarlyON Child and Family Centres? The EarlyON Child and Family Centres employ staff with a range of expertise in early childhood development including trained early years professionals and volunteers. Registration dates are included in our calendars. You can call 613.728.1839 extension 221 or stop by reception at 475 Evered Avenue to register for the workshops. Is there a cost for workshops? No, they are free of cost. Can I be put on a waitlist for a workshop that is full? Yes, a waitlist is available for most of our workshops if required. We call people in the order in which they appear on the list as spaces become available. Is there a cancellation policy if I am unable to attend? We ask that you call ahead of time, providing as much notice as possible, if you are unable to attend a workshop that you are registered for. This allows us to offer the space to someone on the waitlist. Where can I find the workshops that are being offered? All of the workshops that we offer are included in our quarterly calendar, which may be found above. Who can I contact if I am looking for more information on workshops? You may contact us at 613.728.1839 extension 221. What do I need to bring with me to drop-in playgroups? You will need to bring a pair of indoor shoes for you and your child/children, and a peanut and nut free snack if you wish to have a snack while at playgroup. Do I need to register or sign-up ahead of time? No, simply check in at the reception desk upon arrival to get a Playgroup badge. Is there a limit for number of people? Yes, it varies by location and activity. The capacity for the drop-in at our Evered Avenue location is 16 children. Is there any cost to participate in playgroups? No, all of our drop-in programs are free of charge. Where can I find the schedule for drop-in playgroups? You can find our schedule here, at our 475 Evered Avenue location or call us at 613.728.1839 extension 221 and we will email one to you. Playgroups allow children and their parents/caregivers the opportunity to explore different activities, toys, etc. at their own pace. Our playgroups include an art activity, sensory activities, as well as quiet activities including a book and puzzle area. Children may participate in any or all of these activities throughout the drop-in at their own pace. Children may have snack at any time during the playgroup, as long as they are in the snack area and with a parent/caregiver. At the end of playgroup there is a circle time, which includes songs and stories. Once circle is complete, there is half an hour available for the Toy Lending Library. Do playgroups run during bad weather? Typically playgroups run during bad weather, but in rare instances if the building has been shut down due to severe weather such as an ice storm, etc., there will be no playgroup. You may call us at 613.728.1839 extension 221 if you are unsure. Our summer programs in the park are weather dependent. If it is pouring rain and/or thunderstorms there will be no playgroup in the park. You may call us at 613.728.1839 extension 221 or check our facebook page if you are unsure. Are playgroups open during “School Board” holidays? Playgroups are open on the School Board’s PA Days and March Break. Playgroups are closed on statutory and civic holidays. See our Calendar above. How often does the drop-in schedule change? New drop-in schedules are released quarterly. Typically they are released for winter, spring, summer, and autumn. Do you offer any specialized programs or groups? We offer a weekly Postpartum Support Drop-In, an Infant Drop-In Playgroup, and a specialized playgroup in partnership with Ottawa Children’s Treatment Centre. We also offer an evening drop-in playgroup for male caregivers, family members or friends and their child/children. Breastfeeding Support Drop-ins are also offered, as well as Parenting in Ottawa drop-ins. Once a month we offer Rainbow Families Art and Play Afternoon in partnership with Family Services Ottawa. How much does it cost to rent toys? There is no cost to rent toys or resources from our Toy Lending Library. How many items can we borrow at the same time? Two toys and two resources may be borrowed at once. Resources include children’s books, resource books for parents/caregivers, CD’s, DVD’s, etc. Our toys are all sorted by category and include but are not limited to: musical instruments, infant/toddler toys, fine motor activities, dramatic play, story books with props, puzzles, blocks, children’s books, parent/caregiver resource books, CD’s, DVD’s and more. How long can items be borrowed? Items can be borrowed for two weeks at a time. When can I access the Toy Lending Library? The Toy Lending Library is open for half an hour following each of our playgroups. Please refer to our most recent calendar above to ensure the correct times. Do I have to come during toy lending hours to return items? No. If you are simply returning items you can leave them with the receptionist at 475 Evered Avenue. Can donations be made to the Toy Lending library? Yes, we accept gently used items including Little People sets, blocks, puzzles, etc.